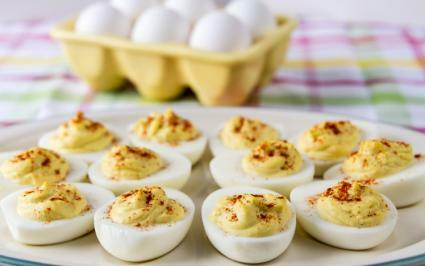 A versatile finger food, deviled eggs make an ideal appetizer for everything from your backyard barbeque to your formal luncheon. You can add spice to give them a little kick, pipe the filling in to make them fancy, or add other more ethnic ingredients to give them flare. Deviled eggs consist of hard boiled eggs, halved and stuffed with a mixture of the boiled egg yolk, mayonnaise, and sometimes mustard. Classically, they are typically topped with paprika to add a bit of color and flavor. 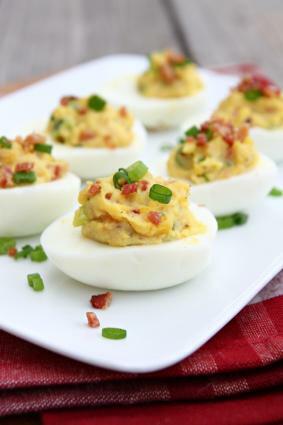 The great thing about deviled eggs is that they are versatile. These variations will bring something surprisingly new to the table. 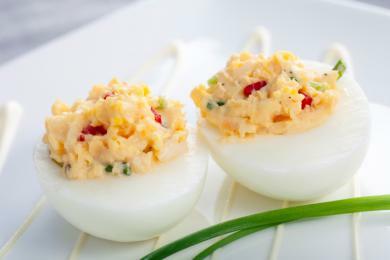 Deviled eggs don't have to be unhealthy. Replace the mayonnaise in the basic recipe with plain yogurt and use lemon juice instead of vinegar. Add chopped, roasted almonds to your filling, and top with either sliced or whole, roasted almonds. Use wine or wine vinegar in lieu of plain white vinegar. Top with bacon. If you really love bacon, add bacon bits to your filling. Pickle juice makes a good acid for this all-American version. Add chopped pickles to your mixture. Try spicy brown mustard for a kick. Use wine as your acid to balance out the kick of the spicy mustard. Start by adding cooked seafood to your filling. You can add about one-half cup to the mixture. Any seafood that you love is fine, but crab, lobster, imitation crab meat, or scallops make ideal additions. Add one-half teaspoon of Old Bay spice to your filling and use white cooking wine as your acid. Sprinkle with Old Bay Seasoning. In lieu of mayonnaise, use ranch dressing. Add copious amounts of finely chopped red, orange, and yellow bell peppers. You don't need to add vinegar to this recipe, and maybe even better yet, the filling will be to chunky to pipe. Just spoon the mixture into the egg halves. The color in the peppers will make the presentation look pretty. Use herbed cream cheese, or herbed spreadable cheese, in lieu of mayonnaise and mustard to give your palate a true experience. Options with garlic or dill make an especially tasty mixture. Top with a sliced olive. Instead of mayonnaise and mustard, mix the egg yolks with Boursin Shallot and Chive spreadable cheese. Use a splash of lemon juice, and add chopped walnuts to the mixture. Garnish with a whole walnut, and thinly sliced apples. Mix cooked beets into your basic deviled egg recipe that omits the mustard. If you like the mixture more on the tangy side, add a dollop of sour cream (but taste test so you don't make them too tangy.) Top the mixture with crumbled blue cheese. Artfully arrange large leaves of romaine lettuce on a round plate. Gently place the eggs on the leaves. The lettuce will keep the eggs from slipping. Use grilled asparagus as a bed for your deviled eggs. Use a square or rectangular serving plate, and arrange the asparagus so that all the tips are facing the same direction. Place the eggs in zigzag pattern along the length of the plate. Use a wide, shallow bowl, and add black dry beans to the bottom. Then you can nestle your deviled eggs into the beans to prevent them from slipping, and create an appealing table display at the same time. Serve your eggs in cupcake papers. This is an ideal presentation for a bridal or baby shower, where you can get cupcake liners to fit the theme. Place each egg on a sliced olive. 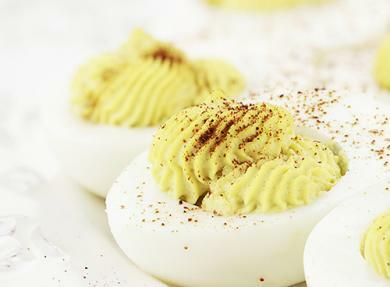 It's not hard to make an impression when you serve deviled eggs. Whether you get creative or go classic, these are often the first things to go at a party. Plate them so they're pretty, or use an egg tray, and your dish might just be the talk of your next party.